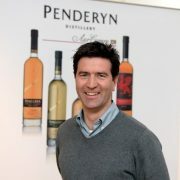 We had an awesome weekend with Michael Wheeler, Global Brand Ambassador of Welsh Single Malt, Penderyn in early March. 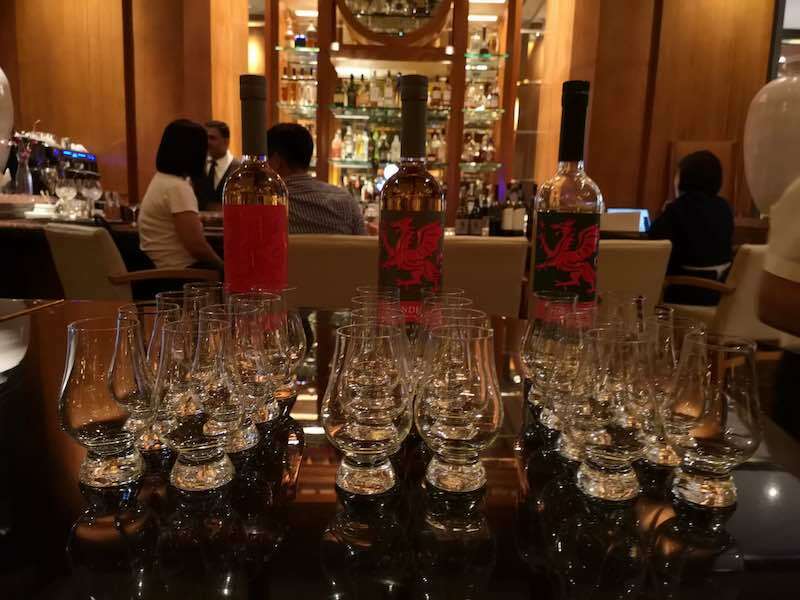 As Wales celebrates St David’s Day on 1 March of every year, Penderyn importer, Spirits Castle Pte Ltd, decided to bring the celebration to Singapore with a couple of whisky tastings amongst other activities. 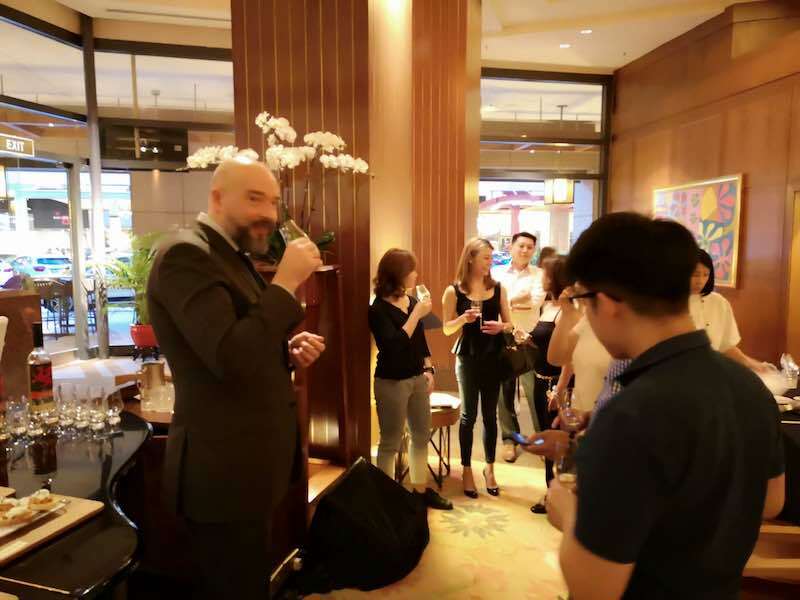 The celebration started at The Providore, Downtown Gallery, where Michael held an impromptu lunchtime tasting of two best-selling whiskies in Singapore, the Sherrywood and Rich Oak. While most people were not keen to start drinking at noon, more interested drinkers came at around 1 pm. Michael had a good time speaking with them about Welsh whiskies, and some of them walked away feeling that they have found gold! He also spoke with two seasoned drinkers who thought that the Sherrywood was quite similar to some of their favourite Scotch whiskies! 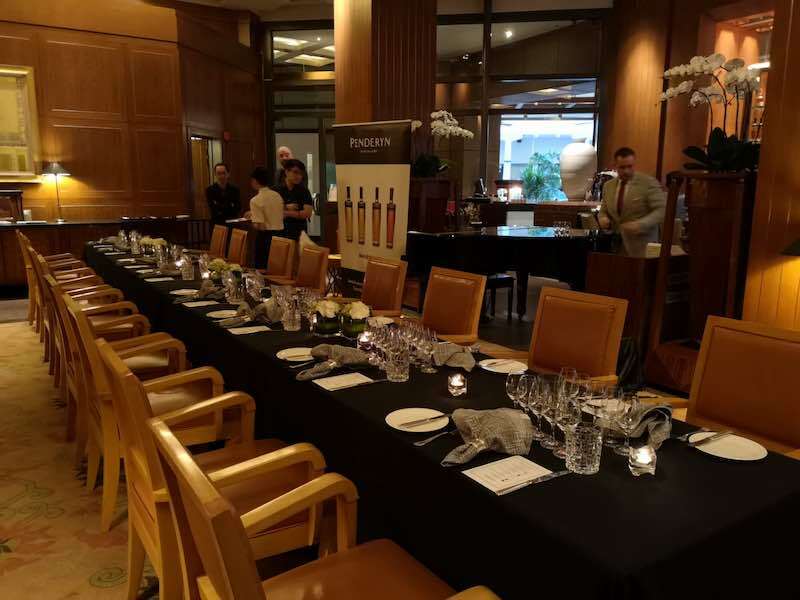 WhiskyGeeks invited ourselves to the whisky pairing dinner at Conrad Centennial Singapore on 1 March 2019 because we had to (wink!) and of course, we were glad that we went! The event was a collaboration between Conrad and Spirits Castle with Conrad doing most of the job. When we arrived, we saw the team at The Lobby Lounge busy working on the set up for the evening. What impressed us though, was that their General Manager was helping out as well! We seldom see a GM who is so hands-on and respected the man who is so willing to serve. The whisky dinner started with a series of canapés and the Dragon Range from Penderyn. The Dragon on each bottle represents Wales and what it stands for. The dragon is, of course, the one gracing the flag of Wales. Michael spoke about the range and intrigued audiences with tales of dragons and myths. The Legend was the first whisky we tried. Matured in a bourbon cask before having a finish in Madeira casks, this whisky is light and fruity, with a hint of oakiness. The Myth is sweeter, with a rounded balance of fruits and candy because it is a bourbon-matured whisky that is finished in red wine casks. The Celt is the most interesting, with light peaty smoke and sweet ripe fruits. Michael explained that this whisky was finished in ex-Islay casks! All the whiskies in the Dragon range are bottled at 41% abv. 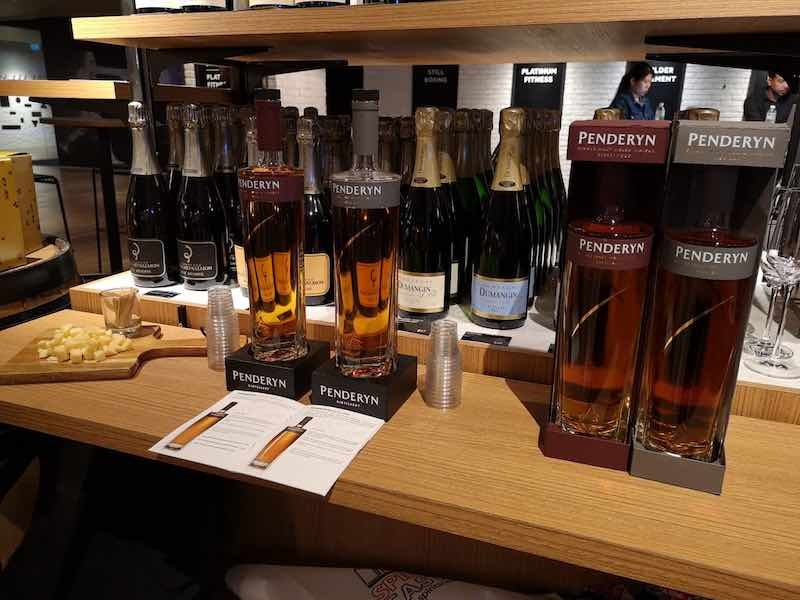 The actual dinner pairing worked with Penderyn Gold Range – a series of 5 different whiskies bottled at 46% abv. 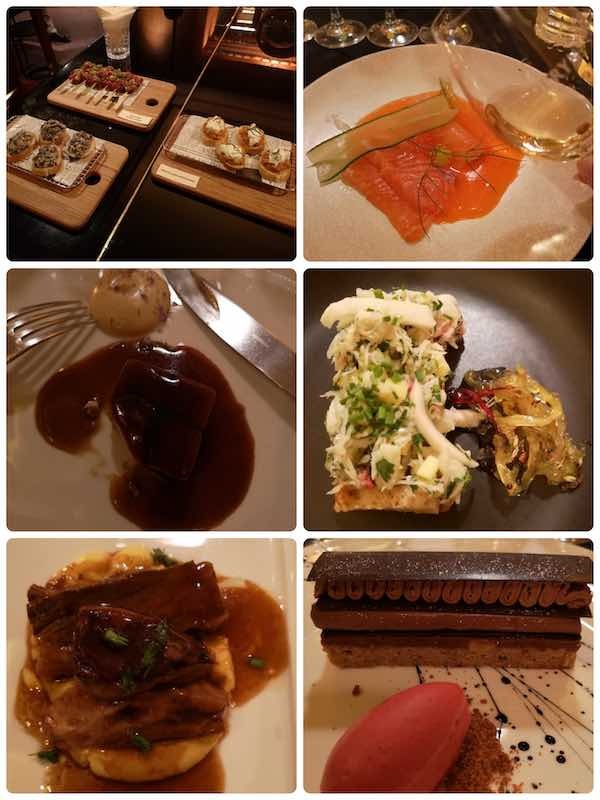 Chef Mandar worked extensively to come up with each pairing, and all of them were fantastic! Our favourite was the Pork Belly with Sherrywood as the pairing worked so well! 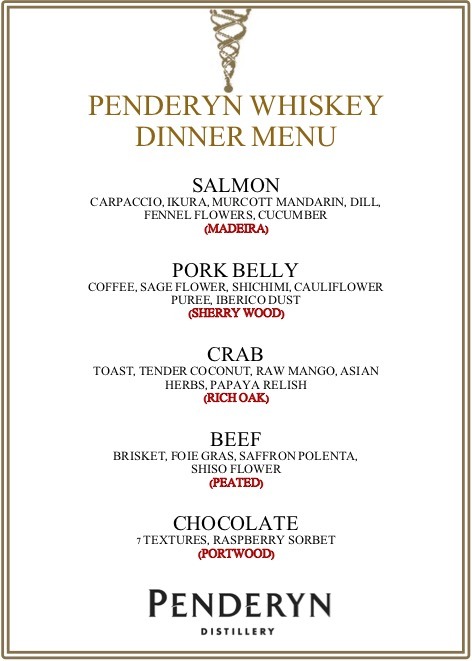 The tender pork belly infused with coffee enhanced the flavours of Penderyn Sherrywood, while the whisky helped to remove the sweetness of the sauce perfectly. We also like the dessert, because the chocolate cake was divine! It was so good that we almost forgot about the whisky! Michael talked about the whiskies at every course, and he regaled tales of the distillery’s history and blunders in a humourous manner. 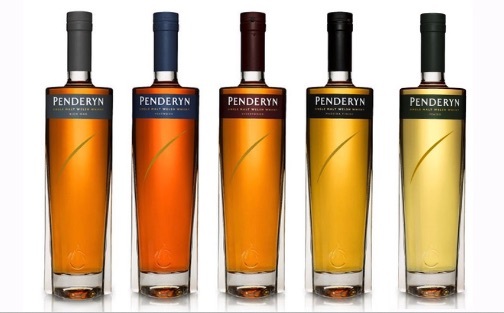 He told us about Penderyn Peated – a mistake that turned out to become a popular whisky in the core range! It was said that the person-in-charge of buying casks for the distillery made a terrible blunder and purchased a batch of casks that were once holding peated whisky on Islay. When the distillery discovered the mistake, it was too late, and they had to release the whisky as a “one-off” experiment because they cannot just throw away good whisky. It turned out that people love the whisky so much that they begged the distillery to continue the production, and so today, it is part of the core range. We ended the dinner with a special cocktail, one which the bartender at The Lobby Lounge did for the event. 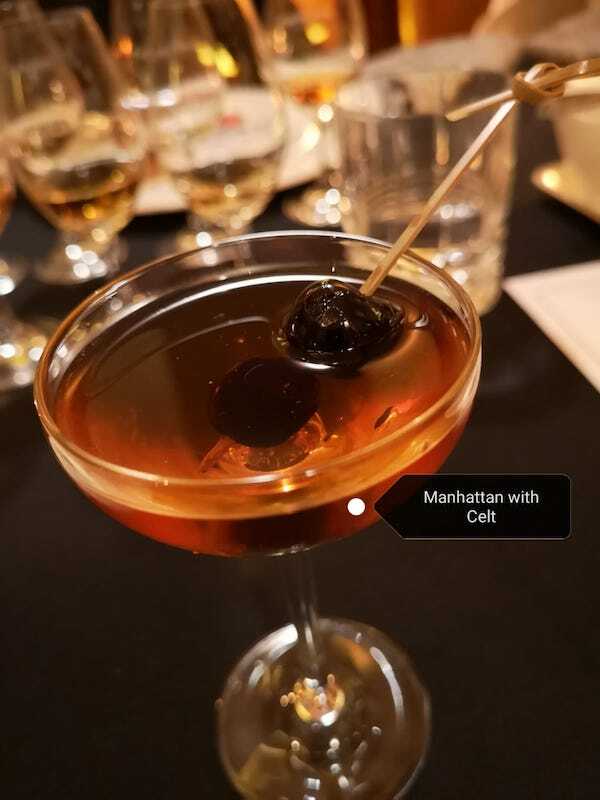 It was a Manhattan but done using the Penderyn Celt. Sweet and smoky, the cocktail was the perfect drink to end a lovely evening at Conrad Centennial Singapore. 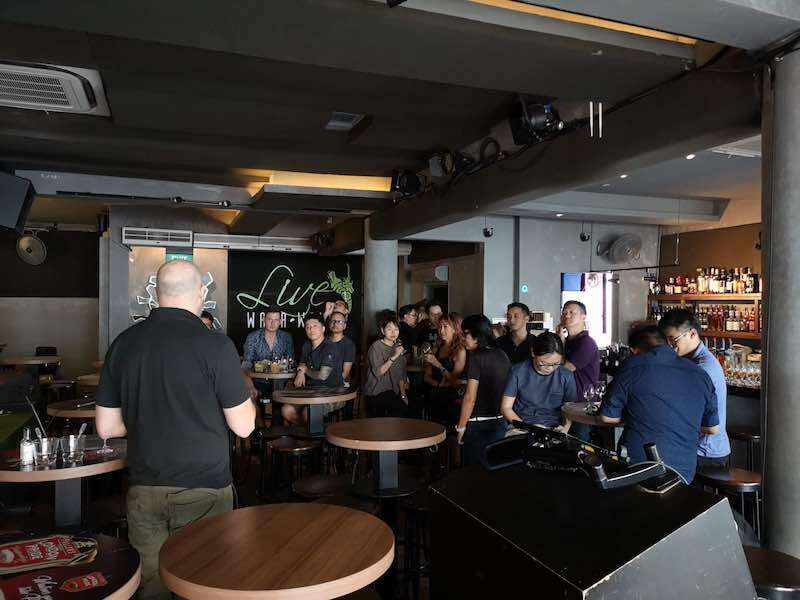 2 March 2019 was equally exciting because Penderyn did a tasting at Wala Wala, Singapore’s iconic bar at Holland Village! We understood that Penderyn distillery (and Spirits Castle) is absolutely delighted with Wala Wala’s support of their whiskies. Wala Wala Cafe Bar is a place that most of the 80s and 90s kids know fondly. It is THE place to hang out, and some of us did more than hang out there – we slept on the floor, drunk, of course! The event was a collaboration between Wala Wala and Spirits Castle. Again, Wala Wala was the one who did all the job of setting up! 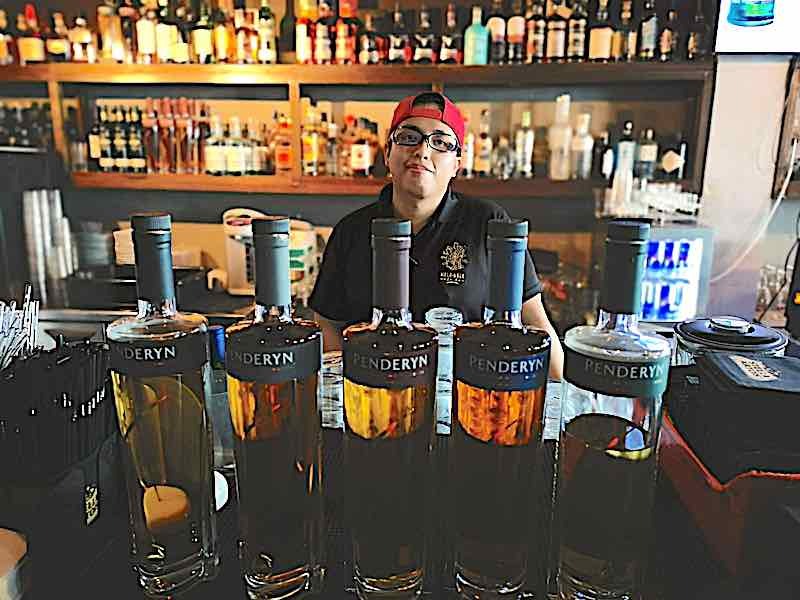 Michael led the group gathered at Wala Wala on a journey to Wales, where he waxed lyrical about the country and the beautiful places that surround Penderyn Distillery. The focus at Wala Wala was the five Gold Range expressions, but participants were greeted with a cocktail done with the Myth! The crowd at Wala was curious about Welsh whiskies, with many of them hearing about Penderyn for the first time. Therefore, many questions flew at Michael, who happily answered them all. He also showed them some interesting elements of the distillation method at Penderyn and explained why the whisky tasted so different from the others. 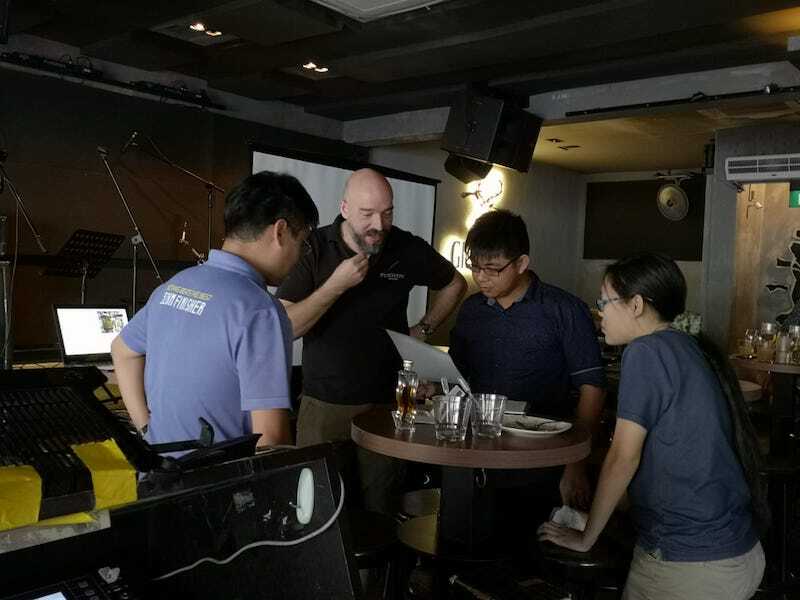 Michael also had a chance to speak with our guest writer of WhiskyGeeks – Hongfu aka Panda. He was delighted to find someone who loves whisky so much that questions came nonstop! It was enjoyable to see them interact with each other and to know that WhiskyGeeks will always have someone to fall back on should we fail to deliver in future! Hahaha!! All of us enjoyed ourselves at Wala Wala, and we are awed by the generosity of the owner – Stanley when platters upon platters of food came from the kitchen after the presentation was over. It was an endless parade of food, and needless to say, we were all stuffed by the time the event ended. So many questions, so much food…Whisky flow aplenty as well, and out of the five, Sherrywood naturally came out tops, again! We had an enjoyable time, and appreciated the efforts that Wala Wala had put in to make the event so fun! 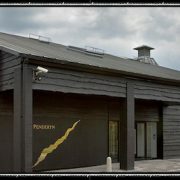 The weekend rendezvous with Penderyn was excellent, and we hope to do it again! 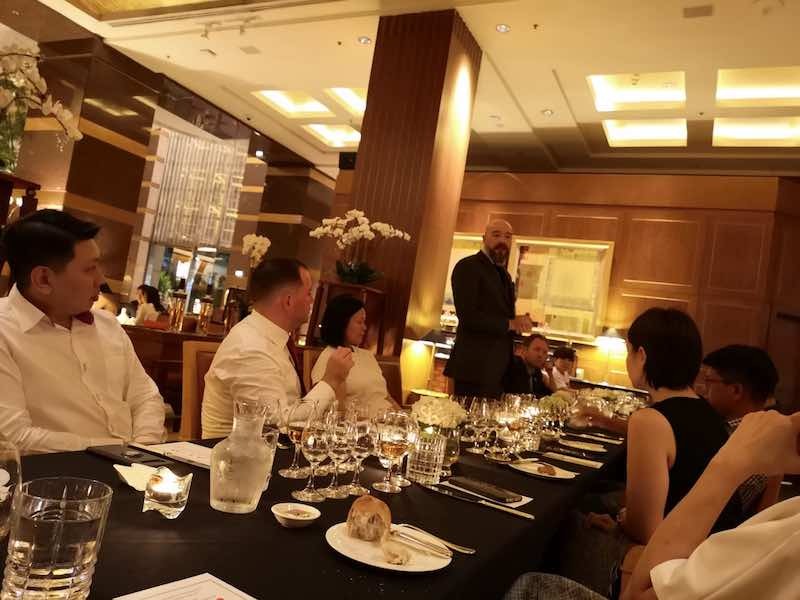 Conrad’s dinner pairing was a luxurious, one of a kind event and Wala Wala’s laidback environment was a complete opposite to it. Both events left deep memories of the place, the whisky and the food. We can’t wait to do this again! Till the next time, folks!! Like what you have just read? 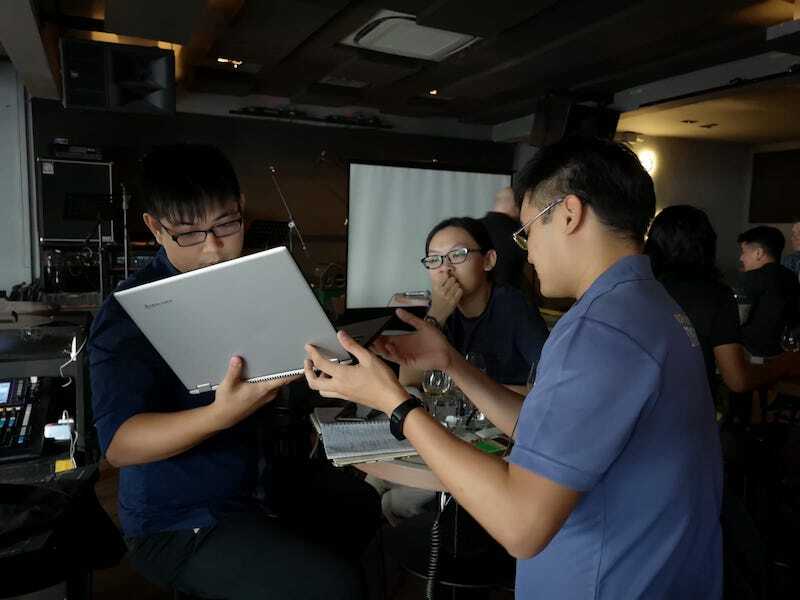 Join WhiskyGeeks.sg as a member for FREE and receive our curated articles and videos in your mailbox every month! The Glendronach Revival 15 Years Old is Back! Have a question about Whisky?